“I couldn’t express the happiness I feel whenever I extend myself to those in need. 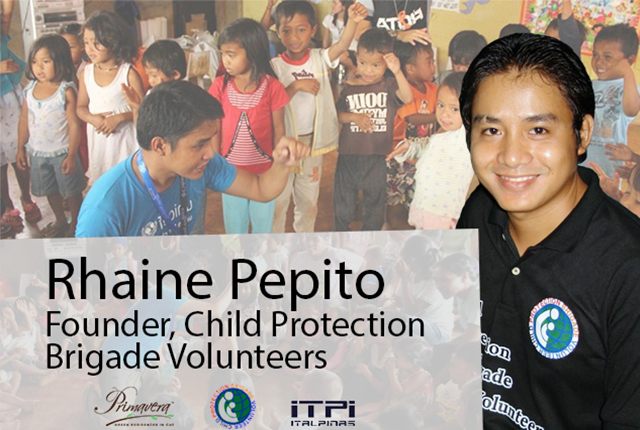 I find fulfilment when I bring happiness with the little deeds I do and I am very humbled to have the privilege of making people smile by just sharing my time and attention,” Renato “Rhaine” Pepito, Founder of Child Protection Brigade Volunteers Organization, shared. Renato Rhaine Pepito, a 29 year-old Social Work student of Lourdes College enjoys having kids around. After his exposure with Community and Family Services International (CFSI), a humanitarian organization committed to peace and social development, with a particular interest in the psychosocial dimension, guided him to his passion and calling in life to found an all-volunteers organization—Child Protection Brigade Volunteers Organization. The Child Protection Brigade Volunteers is a group of young people who commit their time and efforts in serving disadvantaged children in Cagayan de Oro City, Philippines. Their group provides medical and social services to several children’s groups all over the city and nearby areas. The programs of the group include non-formal education, feeding program, and basic first aid to the children who are either living on the streets, in orphanages, or in evacuation shelters. Volunteering allows you to connect to your community and make it a better place to live in. Even helping out with the small tasks in your community can make a real difference to the lives of people and organizations in need. Dedicating your time to volunteer helps you make new friends, expand your network and boost your social skills. Aside from that, experts report that when you focus on someone other than yourself, it interrupts usual tension-producing patterns that relieves you from stress. It also makes you healthier because moods and emotions, like optimism, joy, and control over one’s fate, strengthen the immune system. Rhaine, as he is fondly called by the kids he serves, told Primavera Residences how he was able to pursue his passion for volunteerism. “Basically, I just do what I need to do for the community. Being a volunteer is more than just appreciation and acknowledgement. We serve the larger community without the eyes of the media and other people. We do what we do best and we are happy and proud that we deliver smiles and laughter to those people who are in need. We walk with our hopeful hearts to elevate the future of those disadvantaged individuals and we talk nothing but bringing out the best in them,” Pepito shared. Do you consider volunteerism as a life-long career? Why is being a volunteer a need in this society? What do you want to say about being a volunteer? In the case of other volunteers, on behalf of them, what do you want to share? This National Volunteer Month, Primavera Residences, an advocate of sustainable development and volunteerism, puts the spotlight on volunteers like Rhaine Pepito who offer their time and effort to support those who need it the most. Do you have a volunteerism story to share, too? Feel free to comment below.